Steampunk vest with ruffled collar. Tapered waist line. This vest is elegantly decorated with lace patches and metal studs. Perfect addition to your steampunk outfit! 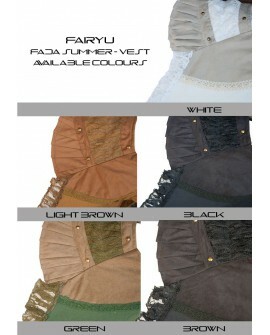 Beautifully made, cotton and lace steampunk vest. From the lovely lace edging to the exotic velvet ruffled collars, you can’t help but feel like a beautiful, elegant pixie in this vest. It has a tapered waist line that helps to highlight and frame your figure in the most flattering of ways. The high level of detailing allows you to wear it over a simple vest top or a dress and is a perfect festival wear. All available colours are presented in the last image. Please make sure to select the desired size and colour before ordering this vest.